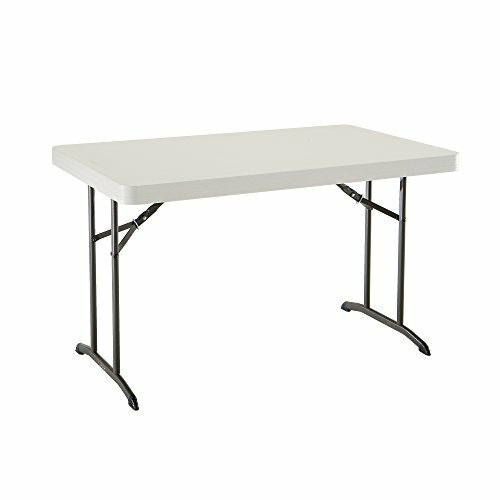 Lifetime 4-foot commercial folding tables are constructed of high-density polyethylene & are stronger, lighter & more durable than wood. They will not crack, chip or peel, & are built for indoor & outdoor use. The patented steel frame design provides a sturdy foundation & is protected with a powder-coated, weather-resistant finish. Perfect for home or office use, lifetime folding tables exceed challenging BIFMA standards & are backed by a ten-year warranty. Folding Wooden Tv Tray Table, Dark Wood Finish, Plus Folds Very Easy Which Is Used for Games or At the Diner. Plus Its Also Great for Pc, Game and a Snack.